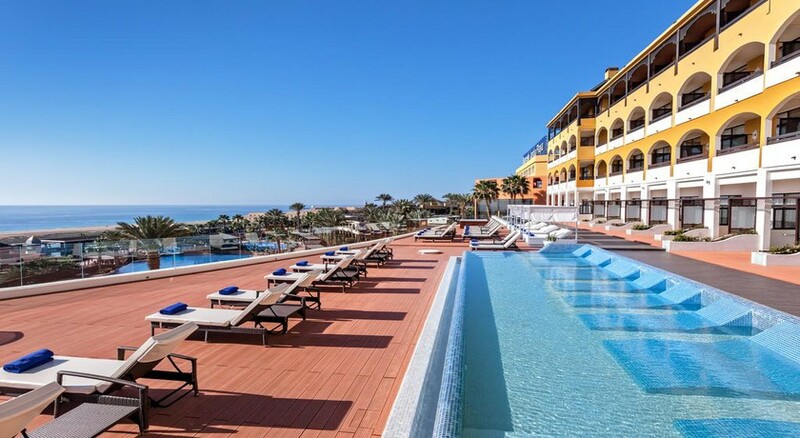 Barceló Occidental Jandía Royal Level is a fabulous 4-star adults-only hotel located in the tranquil setting of Playa de Jandía, one of the best beaches in the Canary Islands, Fuerteventura. Formerly known as Barceló Jandía Club Premium, this exclusive hotel is a favourite for couples holidays and offers maximum comfort for a relaxing stay. You can choose from both half-board and all-inclusive board options. The hotel offers spacious and modern rooms with spectacular views of the pool area and sea, alongside a variety of lively restaurants and bars to indulge in. Water lovers will be in for a treat as the hotel features 5 swimming pools, with 2 of them heated. Go windsurfing on Jandia's breezy coast or visit fine beaches like Cofete, this is the perfect base to explore the peninsular. The hotel is nestled in a carefully landscaped garden and the sandy beach of Jandía is just 500 metres away. The nearest town is Morro Jable, 3.5 km away. Jandía Golf Course is just behind the property. Distance to the nearest harbour is 4.5 km and to the Fuerteventura airport, 80 km from the hotel. The hotel has two types of guestrooms, deluxe and suites. The rooms are equipped with en- suite bathrooms, air-conditioning, TV with satellite, a telephone, fan, coffee/tea maker, hairdryer, safe deposit and fridge. In addition, suites have a furnished living room. There are two main restaurants—Corralejo and Mimosa— that serve breakfast, lunch and dinner buffet style. Club Atlántico serves a lavish breakfast and lunch. Another a la carte restaurant El Rincón de Jandía serves Canarian cuisine during dinner. For Med cuisine, head in the evenings to Placeres Canarios and La Toscana—two a la carte restaurants. Six bars—Hibisco, Tuineje, Aloe, Barlovento, Salobre and Betancuria serves alcoholic and non-alcoholic drinks. Five outdoor swimming pools equipped with beach towels, parasols and loungers are for guests to splash around. Facilities like aqua gymnasium, aqua aerobic, water polo and water volleyball and pool bars exist around the pools. For deep relaxation head to the deluxe spa equipped with Finnish sauna, whirlpool, hydromassage, jet room, and six treatment rooms. A gym, tennis courts, mini golf, billiards, darts, table tennis and facilities for other recreation activities area available at the hotel. In the evening the resident DJs organize parties and live shows.